Cambridge, MA: Harvard University Press. Very Good in Very Good dust jacket. 1914. Hardcover. 0674990412 . Text is clean. Cover shows light wear. Dust jacket shows only minor edgewear. DJ is price clipped. 1970 printing. 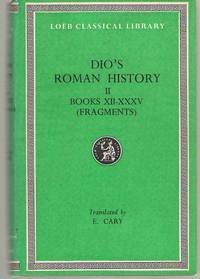 ; Loeb Classical Library; Vol. 37; 6.40 X 4.50 X 0.90 inches .